Christmas is around the corner and it’s time to pick out the perfect gifts. If you’re still trying to find the ideal present for a loved one, here is a list of incredible experiences to gift this festive season. The Canal Cruise is a quick 25-minute cruise around the Foreshore and a great way to travel between the Cape Town International Convention Centre and the V&A Waterfront. Miss the summer traffic and enjoy a leisurely ride with the family. There’s audio commentary in 15 languages and tickets are valid for the whole day! Tickets cost R45 per person and can be purchased here. Located close to the popular Two Oceans Aquarium, the Harbour Cruise is a fun activity that’s perfect for the whole family. The cruise runs every 30 minutes and explores the V&A Waterfront harbour. Spot the seals, take some incredible pictures and learn about the V&A Waterfront's history while listening to commentary in 15 languages. Tickets cost R45 per person and can be purchased here. Visitors can hop off the bus and enjoy a walking tour and get to see the beauty of the city centre on foot for free. The Classic ticket costs R180 per person and can be purchased here. Perfect for couples looking for a romantic night out or an aspiring photographer looking for some gorgeous shots, the Sunset Tour is a summer’s delight. The tour runs for three hours and travels all the way up to Signal Hill from the V&A Waterfront. It’s a beautiful evening out with friends and perfect for someone who loves an outdoor adventure with incredible views. Tickets are R110 per person and available online here. The Blue Route Pass A fabulous gift for anyone who loves exploring by themselves and loves a holiday jam-packed with activities. The Blue Route Pass is best way to see the Cape Peninsula and a host of incredible local attractions. So what do they get to enjoy? The pass includes the red-bus Classic package ticket on the Mini Peninsula tour. 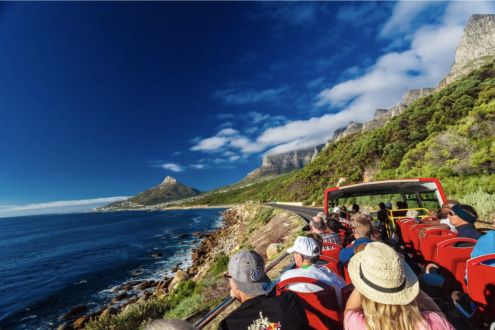 Visitors also get free entry to three top attractions along the Mini Peninsula Tour, which is great for anyone wanting to see some of Cape Town’s most popular spots. Tickets cost R395 and can be purchased online here. Have a wonderful festive season. We look forward to seeing you and your loved ones on the red bus!